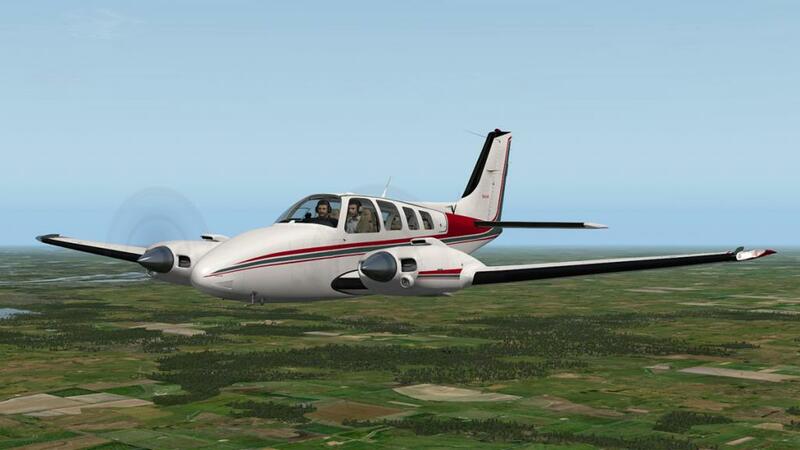 SimCoders have released their latest REP or Reality Expansion Pack for Carenado's B58 Baron general aviation aircraft. 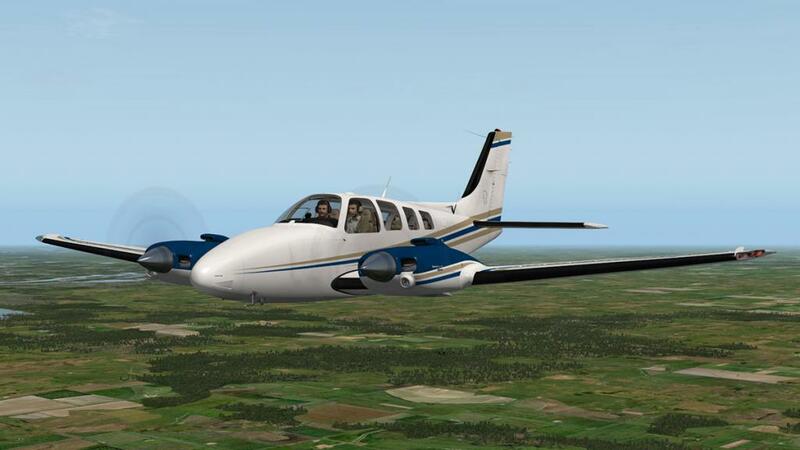 This expansion pack covers many areas including the aircraft's flight dynamics, more onboard systems and failures, extra tools including maintenance hangar, a kneeboard, the weight & balance and an extensive walkaround, sounds are also more highly advanced. 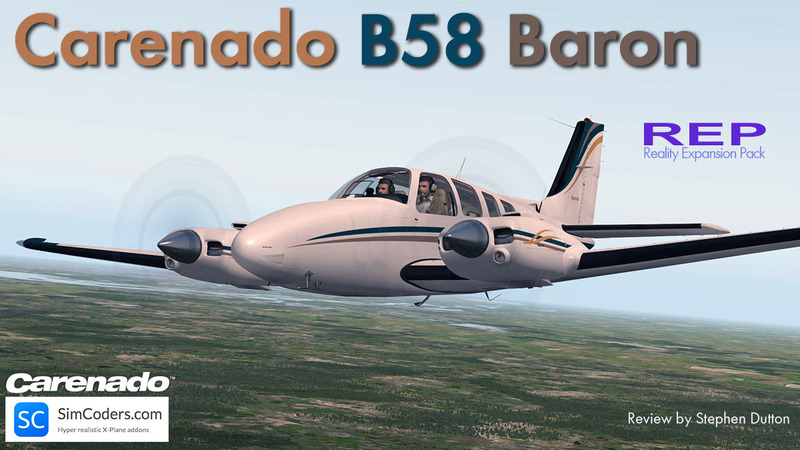 Before we cover the REP package, let us familiar ourselves with the original Carenado B58 Baron. 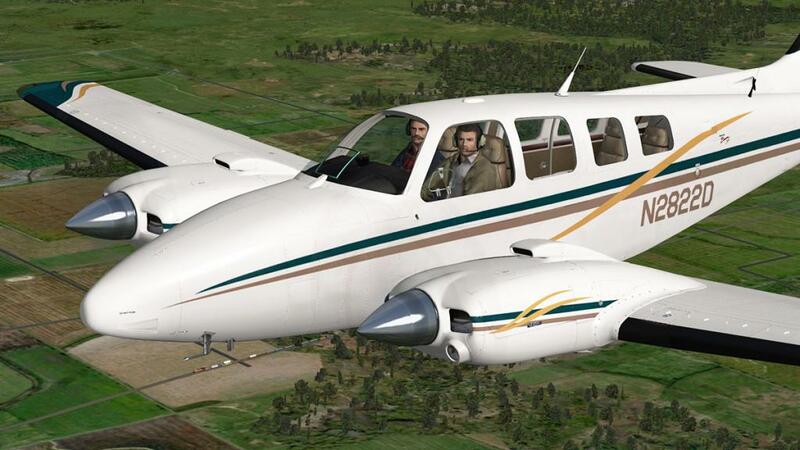 The aircraft was released now in Nov, 2012 and that is four years ago to date. 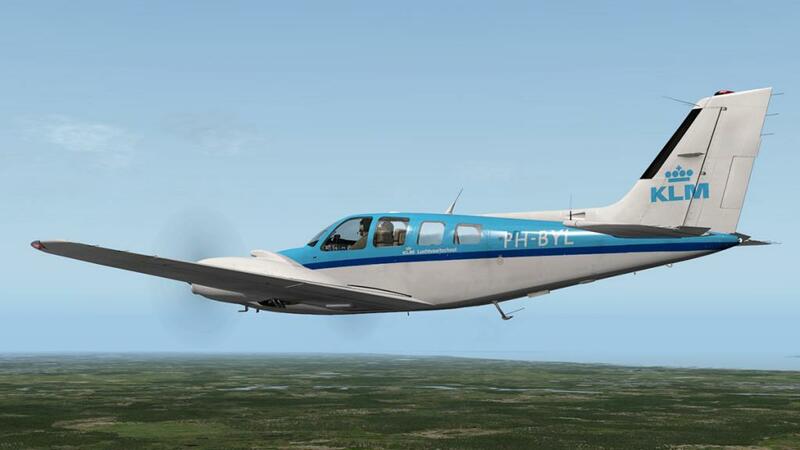 That is not to say the aircraft is old or out of date, in fact it is the opposite in the fact with the many updates and revisions the current v3.0 release is a pretty solid aircraft now with very few if any bugs or quirks. 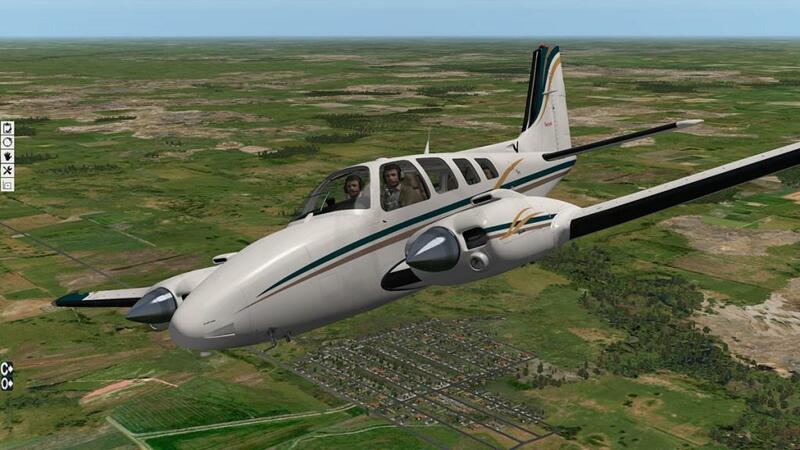 Admittedly it is a fairly basic aircraft, and has few real special effects. 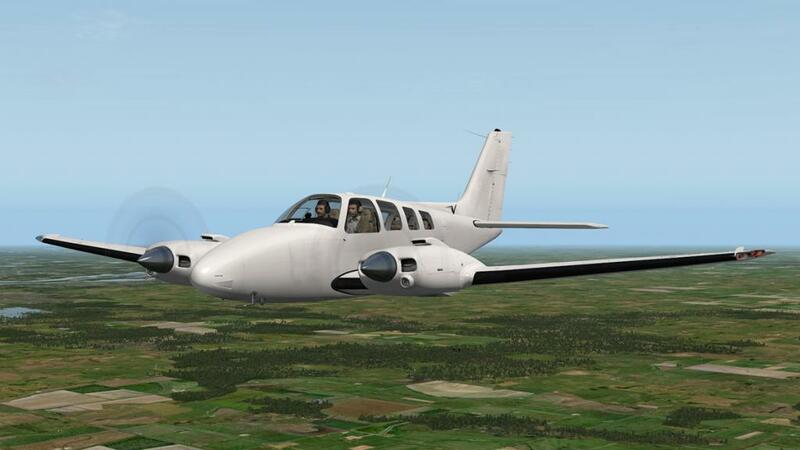 But that is to the good as the aircraft is brilliant and simple to fly, and a great starter for anyone who wants to learn to fly a good solid twin-engined aircraft, as for being a very good twin training aircraft I can't think of any better aircraft to use. The B58 Baron still looks and feels great as well, the lines are clean and unfussy, and it is quite fast at 205 knots (380 km/h, 236 mph) at sea level, with a Cruise speed of around 190-180 knots. 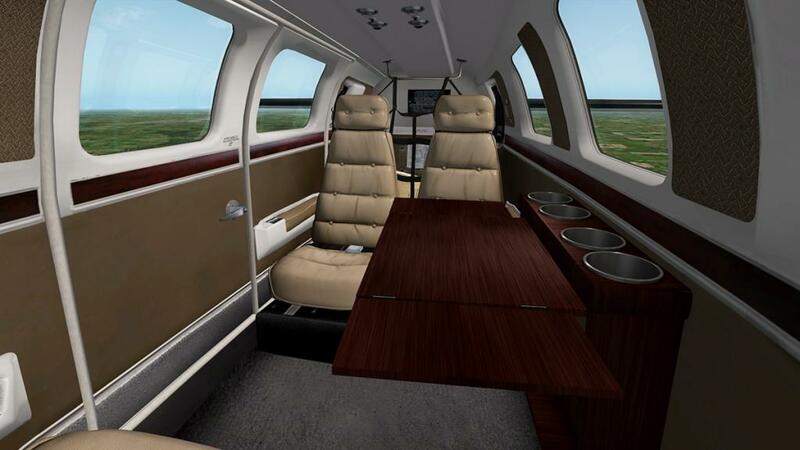 Cockpit and panel is fairly basic, but again great for a first time user or if you just want a no fuss fly to somewhere. 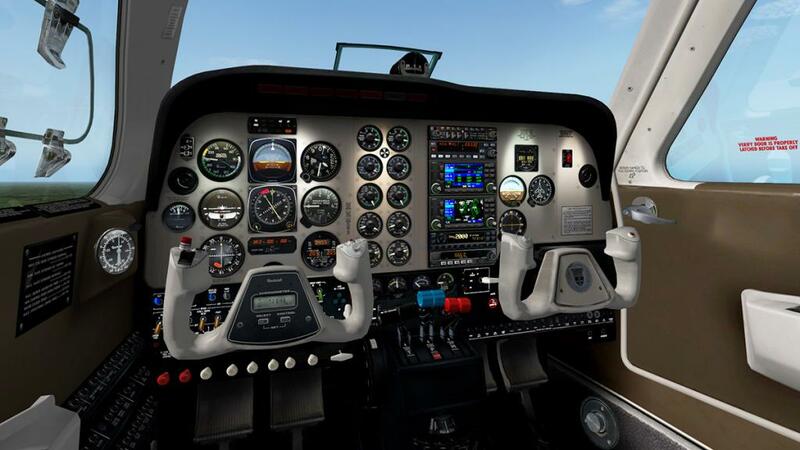 Most instruments are oriented for the pilot and the right seat is really just for casual flying. 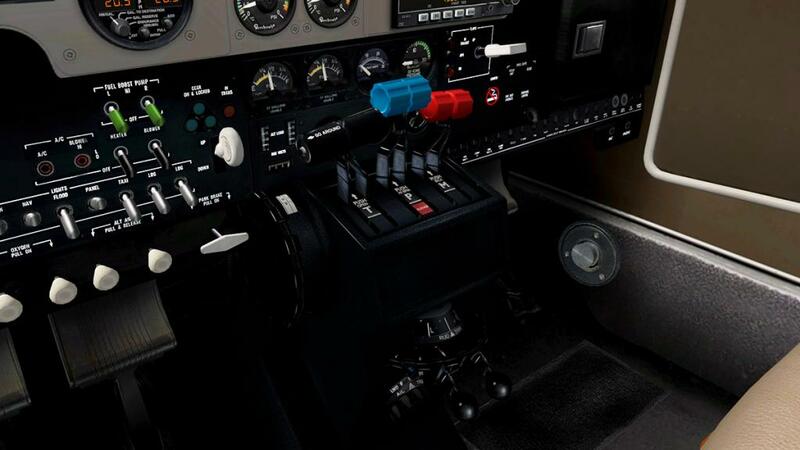 Switchgear is set out all together behind the pilot's yoke, not a lot of adjustment here like with the panel lighting (on/off) but still very comprehensive in detail. 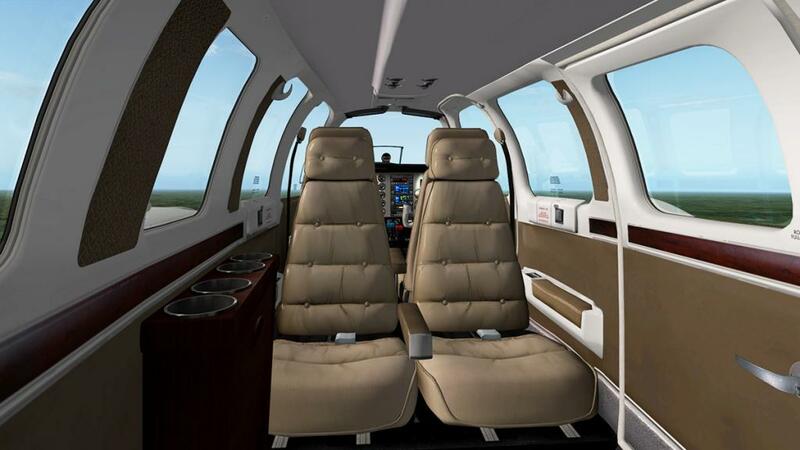 centre pedestal has all you need but nothing more in the standard throttle, propeller (feather) and rich/lean mixture levers and trim wheels. Equipment stack is dominated by two Garmin GNS 430's GPS. Both pop out for ease of use. Standard issue Garmin 347 audio panel is top with the KFC225 Bendix King autopilot below (then the two Garmin's) with a Garmin GTX 327 transponder centre and finally lower a KR87 TSO ADF unit. Cabin seating is arranged in a four seat club layout with a folding out table (very nice). 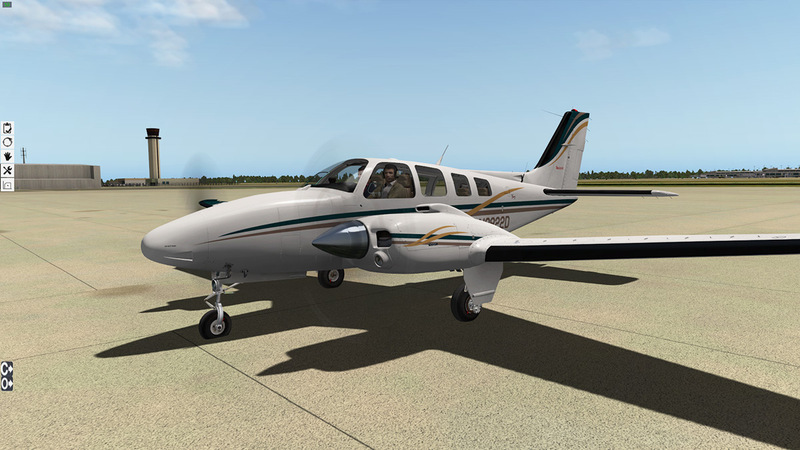 Cabin detailing and (spot) lighting is excellent, and as this is an early Carenado, you still get the baggage items behind the seats and in the forward baggage compartment. 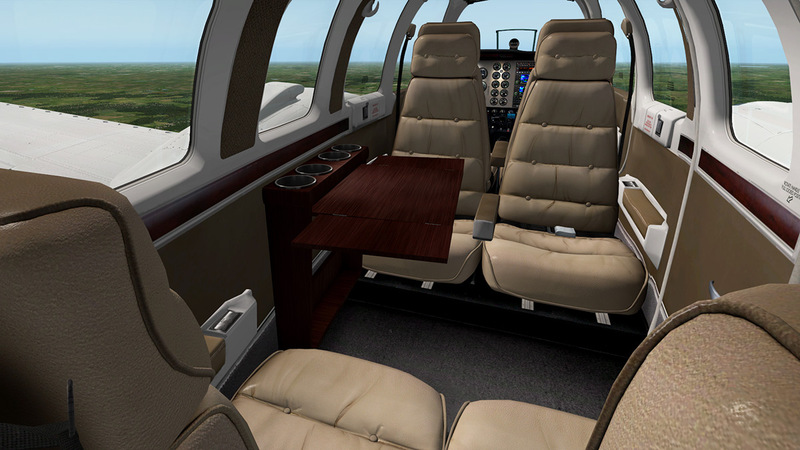 Only two pop-out menus with the standard Carenado "Cameras" panel and the lower "options" panel, both are basic and there is no "autopilot" pop out that you usually get with current Carenado's. 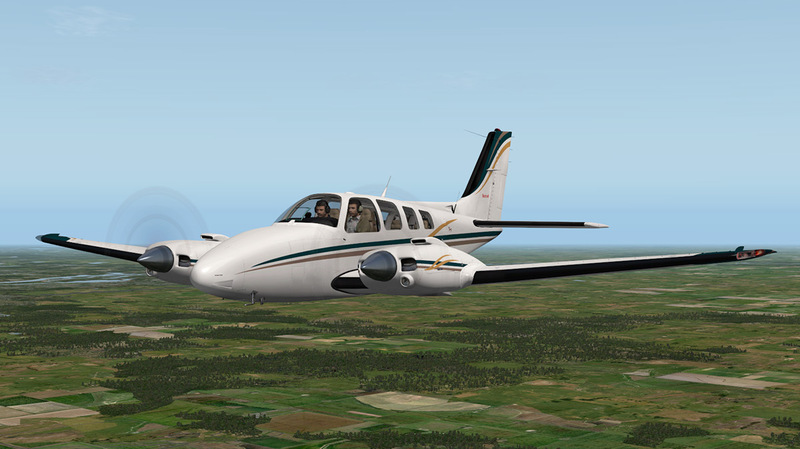 So the Carenado B58 Baron makes a very good basic platform to add on a REP package. 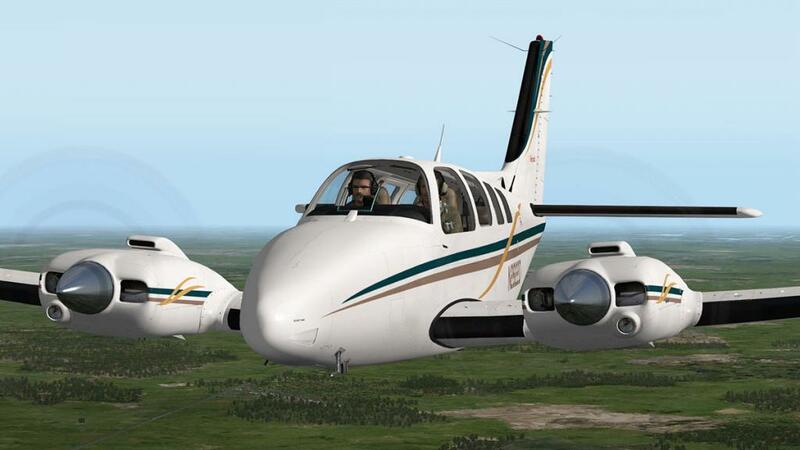 These Reality Expansion Packs are created to extend many areas of the aircraft's flight dynamics and systems and to improve on the already very good layouts from Carenado. Installing the REP package is really quite easy, as in the download package you get just one folder named "REP" and that folder is installed in the aircraft's plugin folder (just drop the whole folder in) and that is it, very easy and done quickly. I do recommend to have two complete versions of the Carenado B58 Baron, the standard one and one I labeled "Carenado B58 Baron REP" because you never know if you just want the basic version to just simply fly, as we shall see. 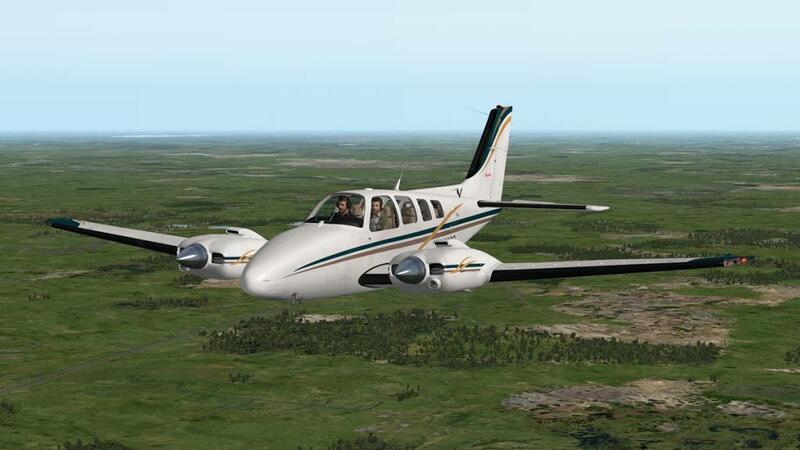 When you start up the REP version of the B58 Baron you are asked for a key (provided) and the authorisation page is on the X-Plane "plugins" menu under "SimCoders.Com - REP"
With the REP package installed you also get a five tab menu on the left side of your screen. 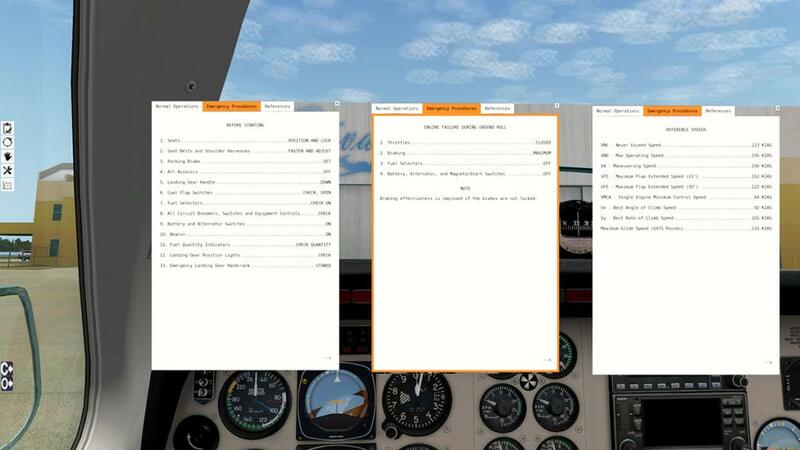 First upper tab is the kneeboard or checklist feature. 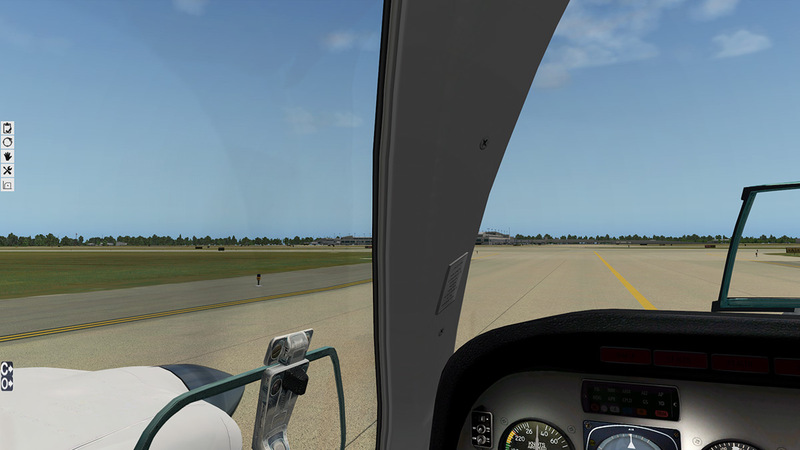 pop-up Kneeboard is very good and covers Normal Operations, Emergency Procedures and References (v Speeds). 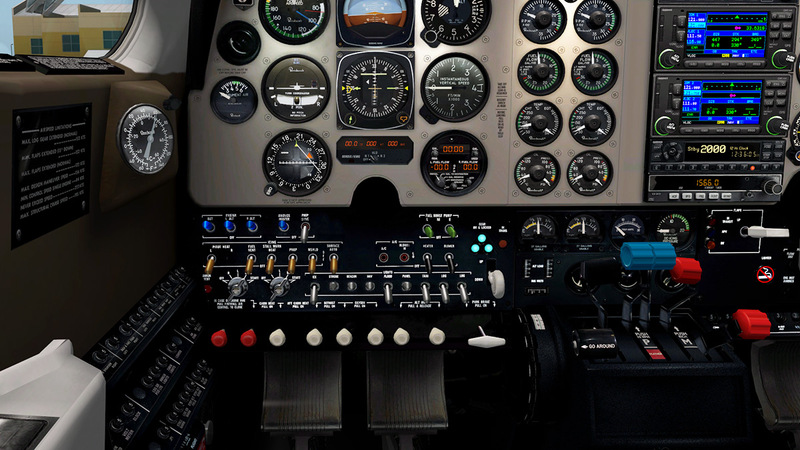 The kneeboard is very handy and comprehensive, but annoying as well because it constantly pops up for no reason if you press items on the panel or touch other things releated or not to the feature. Second tab is the walkaround feature. ... 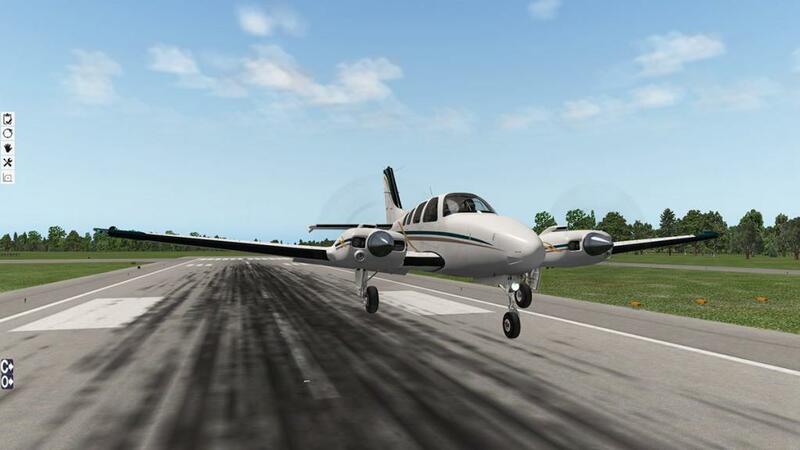 It is more involing than most as many items are animated like your Ailerons, flaps, elevator and rudder. You press the centre button to check (animate) with sound all the flying surfaces, it is comprehensive and very good. 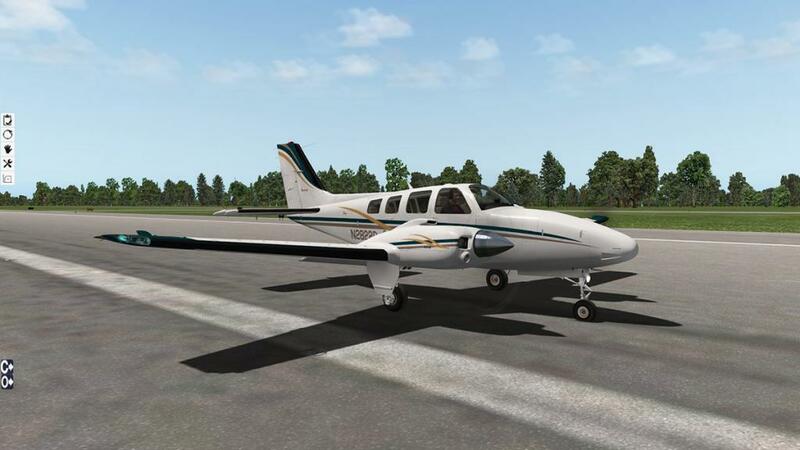 ... but the walkaround goes a lot further than that as you can also check tire wear, Oil Quantity, fuel Quantity and even the water contamination within your fuel tanks, it is as note a very comprehensive check of the aircraft. You need to turn off the brakes, then use your joystick with up-down for forward/reverse and left-right for left turn/right turn. 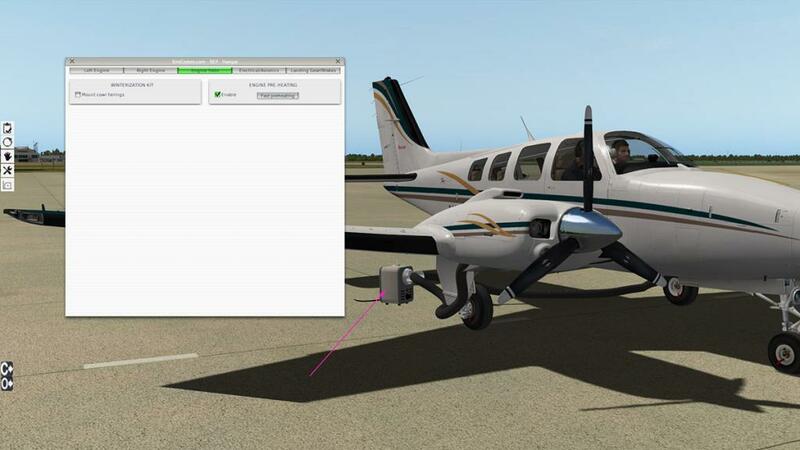 The fourth tab is the Maintenance Hangar feature that allows you to check wear and tear on the aircraft and if required then perform Maintenance to fix or rectify the issues. First two tabs relate to the two engines and their general wear and tear. 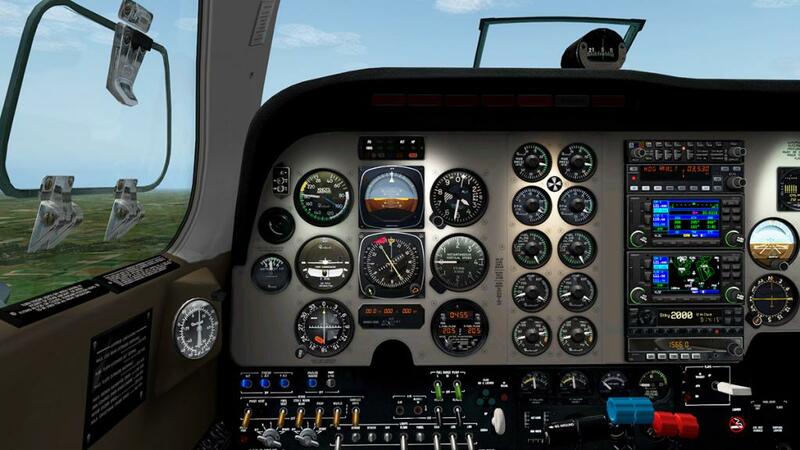 As I have not done too much flying yet, the settings are still mostly as new, but you need to keep a eye on the items on this panel as you use the aircraft or suffer the consequences. There are two options on the "Engine Tools" tab. One is the "Winterization Kit" that puts two cowl fairings in the engine inlets, but watch your temperatures to not over heat the engine if you move to higher temperatures. 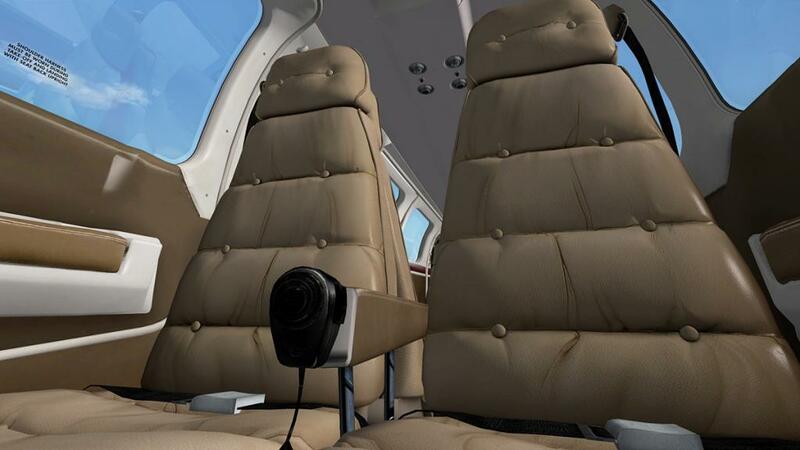 Second is another winter tool in that you can pre-heat the engines with a (noisy) heater provided outside the aircraft. Last two items on the maintenance hangar panel is the Maintenance for both "Electrical/Electronics" and "Landing Gear/Brakes". 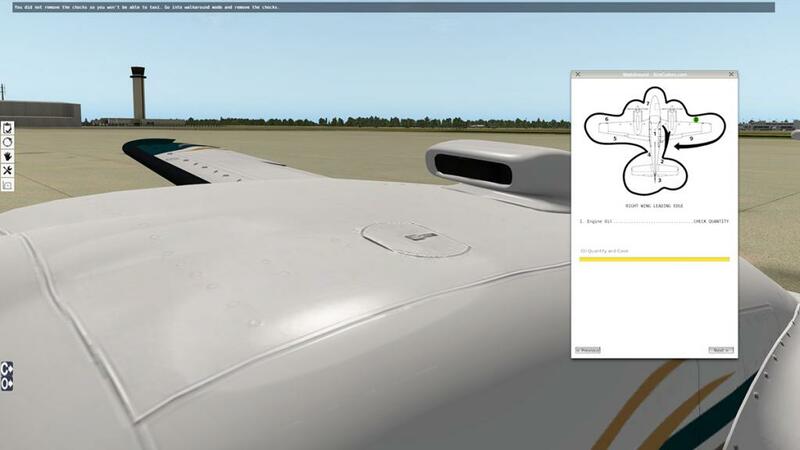 Also note that many items on this maintenance panel are also noted on the walkaround feature and vice-versa, and all items in the maintenance panel to be changed/fixed can also only be done with the engines switched off and you have to be on the ground. 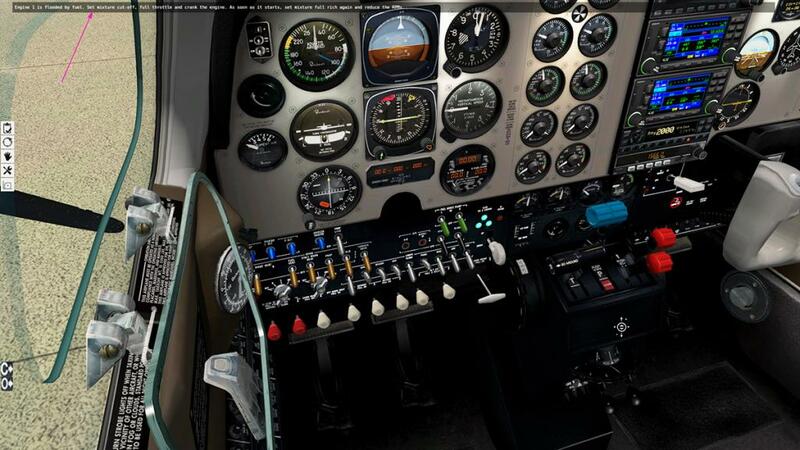 Another item that was rare but now common on X-Plane aircraft is the "Weight & Balance" panel. 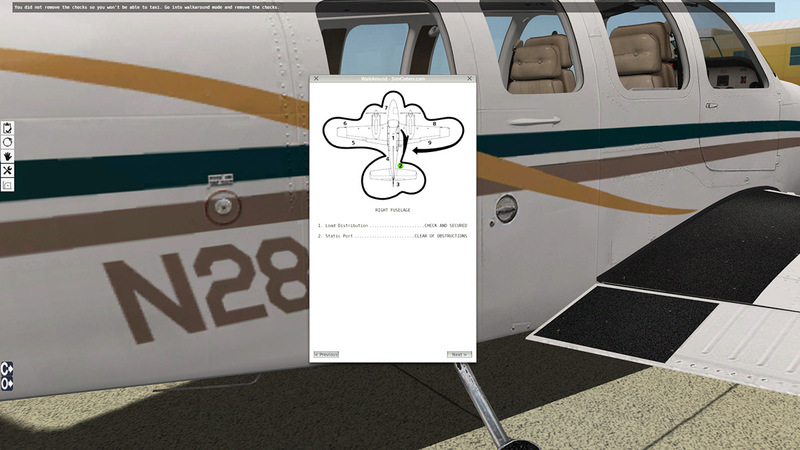 The SimCoder's version is very good with a "Centre of Gravity" graph to show you your balance and weight on the aircraft. All weights including pilots and passengers can be inputted along with their baggage. Fuel can be added or emptied, and you get C.G. 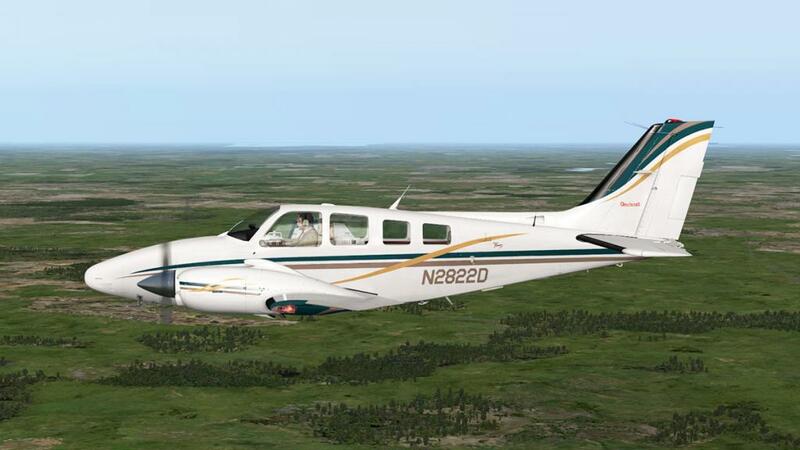 predictions with estimated flying time. A total summary of all weights is shown bottom left. 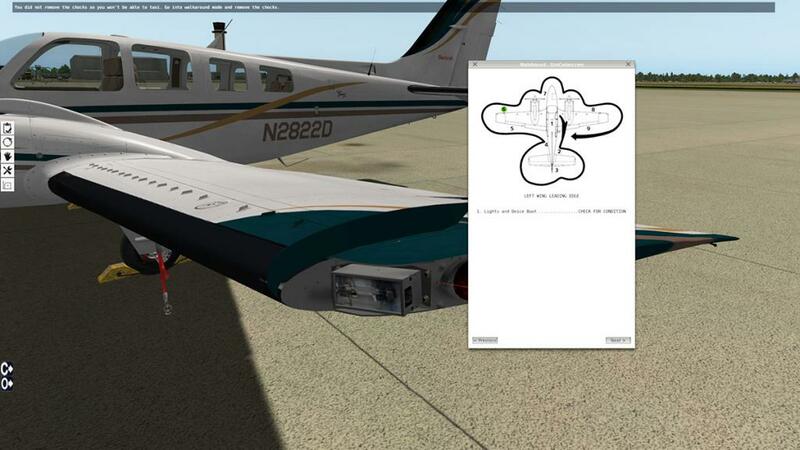 You can then apply all weights and fuel input to the aircraft. 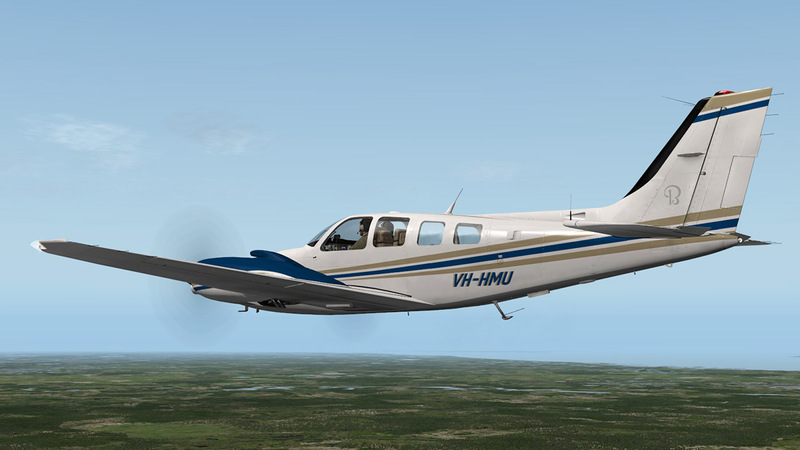 (note just check you do have actual fuel on board before you fly, as most times the aircraft is shown empty and not half-full as usual by X-Plane standards. 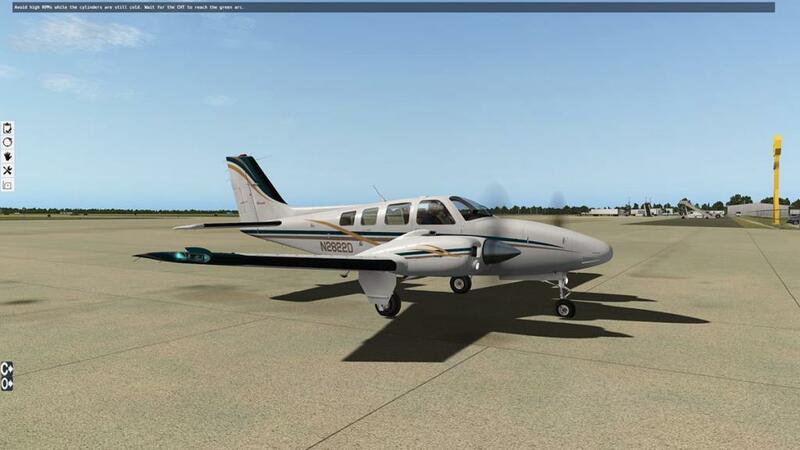 Although the Carenado version is of very high quality, you do have say another complete step of features by using this expansion package. 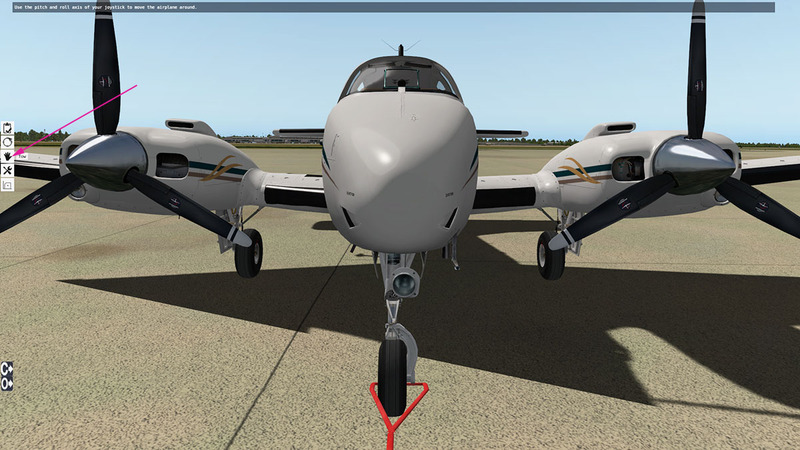 SimCoder's have made sure you get the best possible real life experience that you can get with the REP package, but one feature that I can't simply surmount every time I use the REP is just starting the engines? Yes I understand that old aviation piston engines are cranky things, just like old cars can be. But the time and effort required here to start the engines can be a bit daunting... worse here as you have two cranky engines to start and not just one? 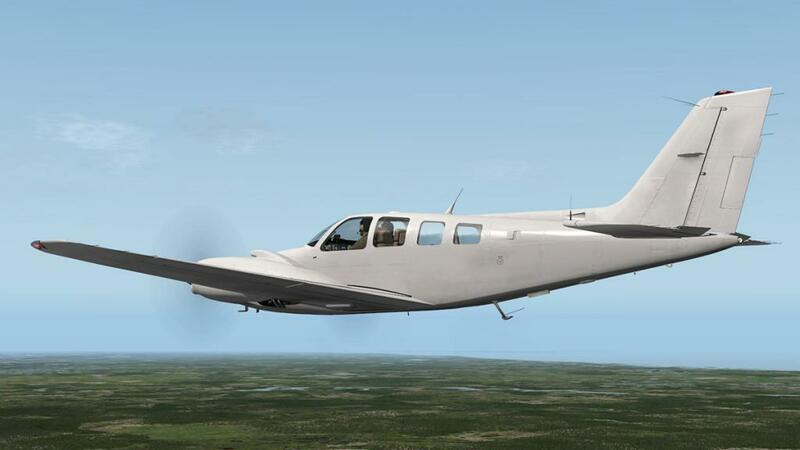 There was the point that just simply cranking over the engine with no go can go past the point of just leaving the REP package and just going back to standard Carenado aircraft to just go and fly. 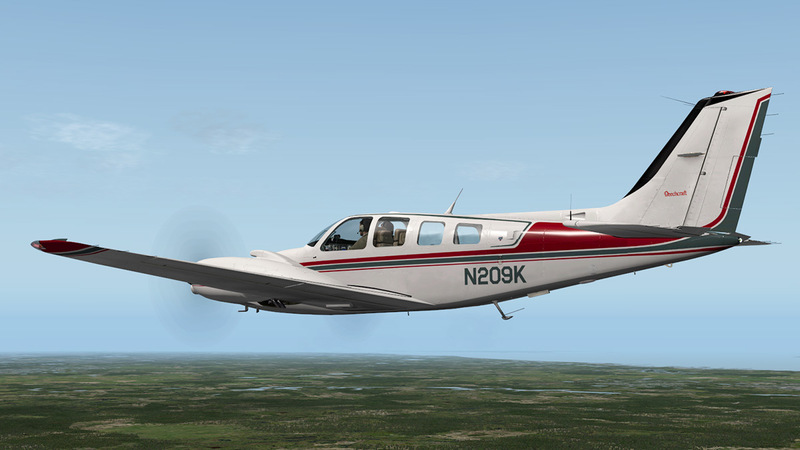 I have the REP package on the excellent Carenado Bonanza F33A and although I loved the added realism of the REP package, the starting feature continued to beat me and maybe I should have persisted more than returning to the standard Carenado version. No doubt this is all very authentic, and I don't say that SimCoders have not done a brilliant job in recreating a perfect feel for this environment, but a slight helper or reset would make all the difference to this sequence of the simulation. 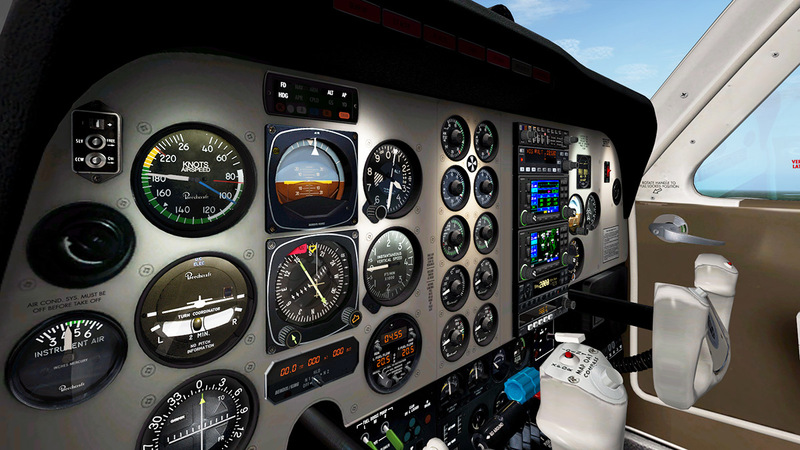 If they do actually start I do love the adjustments to warm up the engines, no doubt this is highly realistic, and you can't fly until the engines are actually ready to go and all the needles are showing all the correct numbers and temperatures. You have to find the right RPM or otherwise the engines will growl at you (or at the worst conk out! ), too fast and you are running too fast and too slow is the death zone. 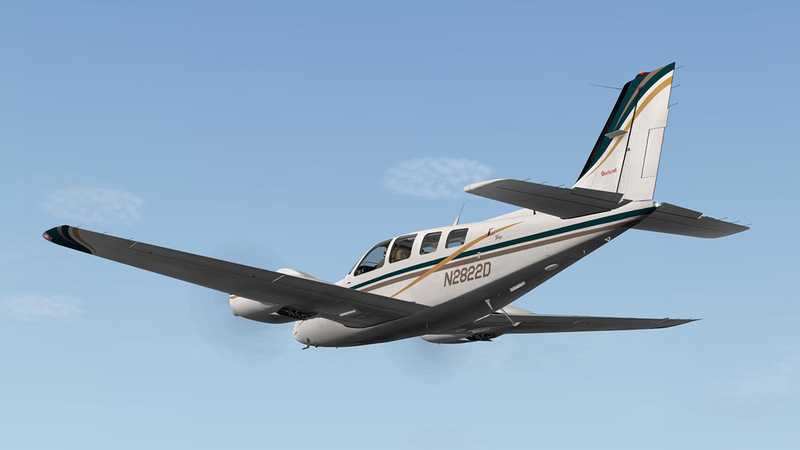 But you find the right setting by leaning the engines and adjusting the throttles, certainly a split throttle system is a real bonus with this REP here. 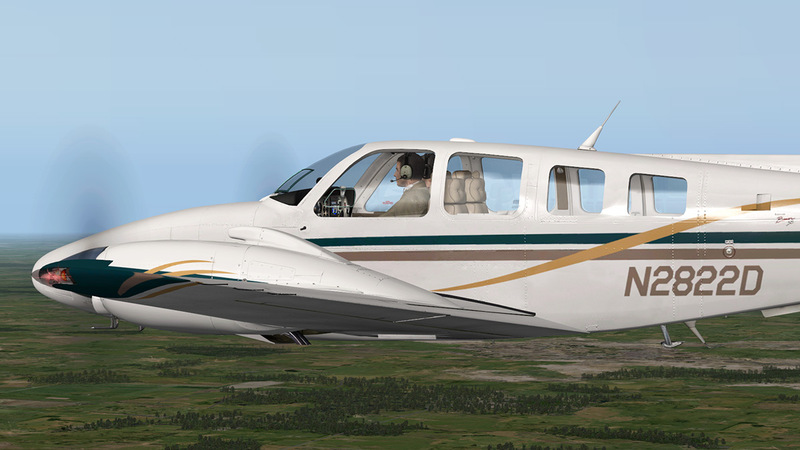 We could never criticise Carenado's packaged sounds, but SimCoder's have certainly added a lot to the variety and depth of the sounds, certainly in the range in the engines. You now go from engine clicks and stutters, to and excellent start sounds, to the many varied sounds in the lower lean and idle throttle zones. 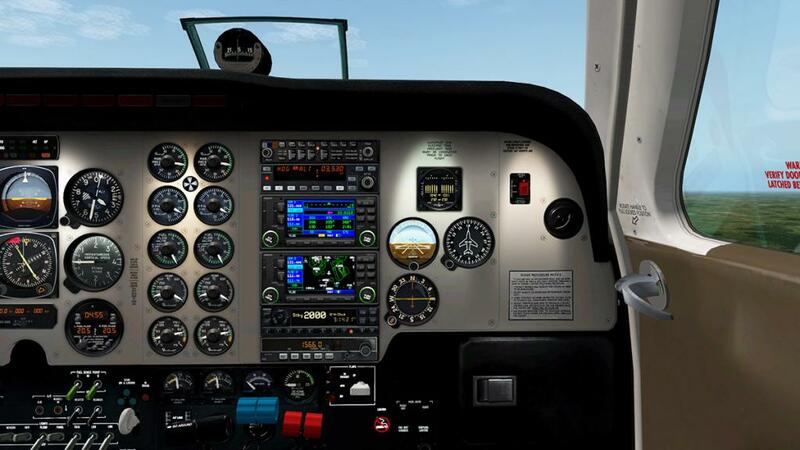 To a point these sounds are important for you to guess the condition of the engines and the correct lever adjustments make the correct feedback including the horror "stutters" and misfiring fouled plugs... It is all very well done for realism if not for the stress it can also cause to your already fragile heart. 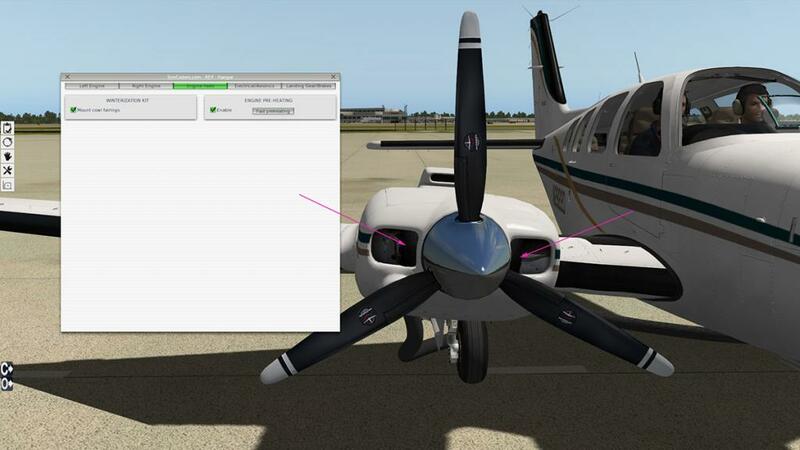 Fine details like propeller sync can also effect the torque of the engines and you have to use it realistically here and switching on is under 25% RPM, if not you get a warning. As you adjust the engine RPM (locked together here under the single throttle control) there is a noticeable difference between each engine in performance. 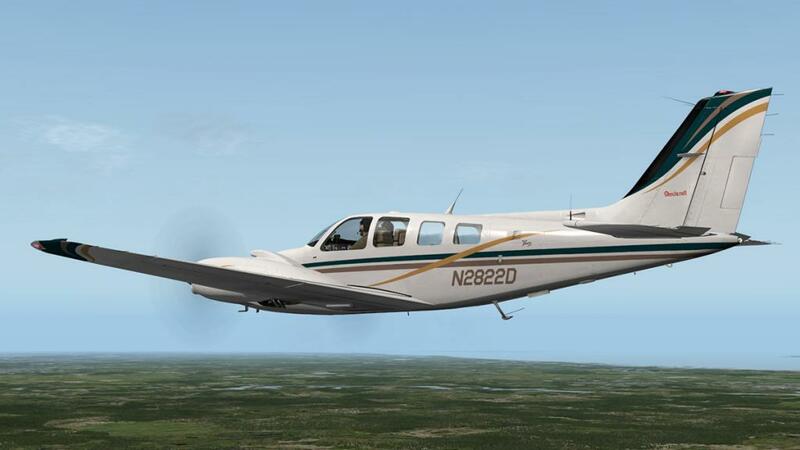 Certainly these differences will expand more as wear and tear with more hours of flying take their effect, and any maintenance performed is noticeable on the sounds and gauges as well. Excellent extra sounds continue in the air. 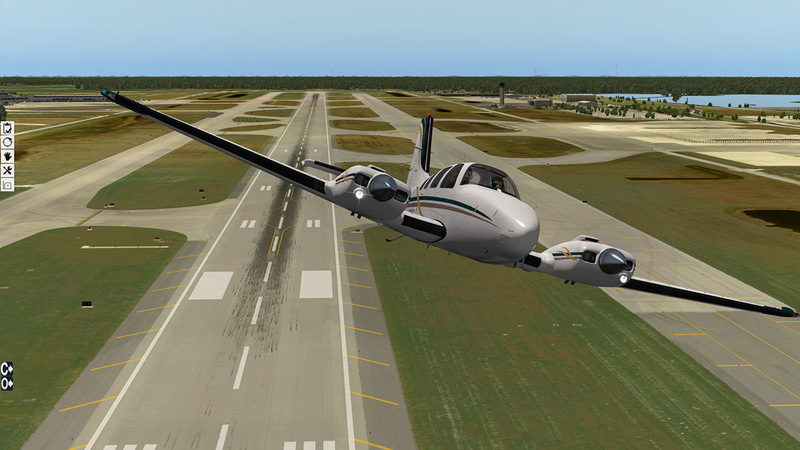 Wind sounds and landing gear activation and wind noises all add into the effects of realism, but the cruise engine drone is an acquired taste, and you lose a little of the those lovely 3d surround sounds that come with the Carenado version. 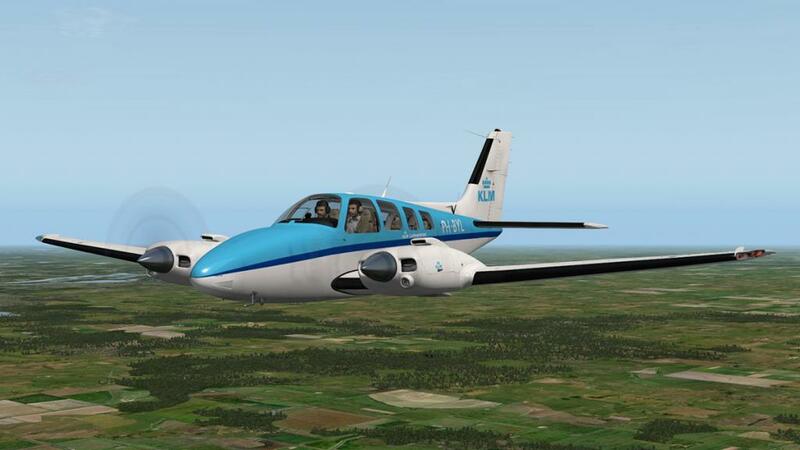 SimCoder's advise to use their excellent "Headshake" plugin and I would certainly second that, in fact I always use headshake as it is a very good effect plugin on all aircraft... take it away and you certainly see and feel the difference, so it is a must have in X-Plane. Systems in oil and electrical are highlighted as well and you can have oil pump failures and realistic vapour lock. 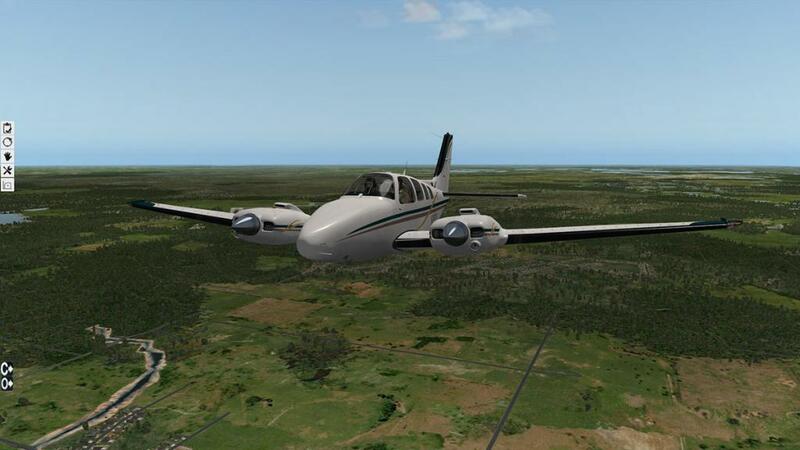 SimCoder's have tuned the Baron for more realistic stall speeds & behavior, correct climb speeds and more realistic cruise speeds, the aircraft does feel significantly different. I flew the standard Baron down from KLAL to KRSW Florida and with the REP version doing the return trip, and yes the aircraft is a marked contrast from the original in all aspects of the flight model, certainly you notice the engine behavior is very different machine from the more highlighted sounds and gauges. 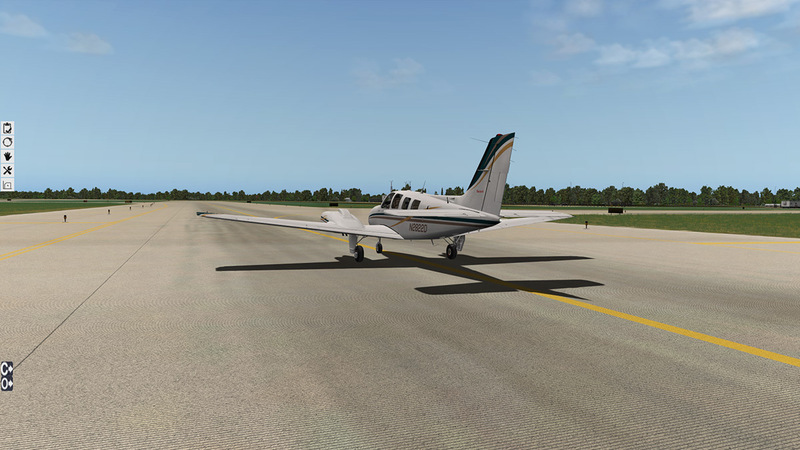 The start point with the standard Carenado version (which you have to already have to use this REP package) is certainly an excellent base line, as it is a great simple twin-engined aircraft that is sweet and easy to fly. So the extensive intergration of the Reality Expansion Pack (REP) does feel and add in a huge difference and experience to that base model design. And extensive it certainly is... the package covers a huge amount of detail, but mostly it concentrates on the feel, running and realism of running those two IO-550 engines. You work hard in this cockpit just working the levers to get the right outcome of keeping those two cranky engines flyable and in a good workable condition, and that certainly expands out the experience of using and flying your own B58 Baron aircraft and in the end that is the ultimate goal of these packages in realistically replicating the ownership of a certain type of aircraft. 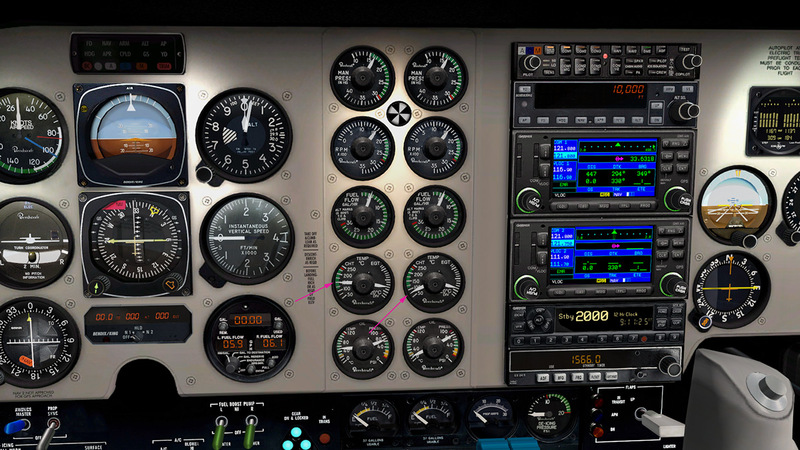 Negatives... for one mastering the start and operation of the engines is one of the biggest challenges you face, most owners of these REP packages will have easily done so, so don't fret it can't be done, but do expect to find that an early learning curve. 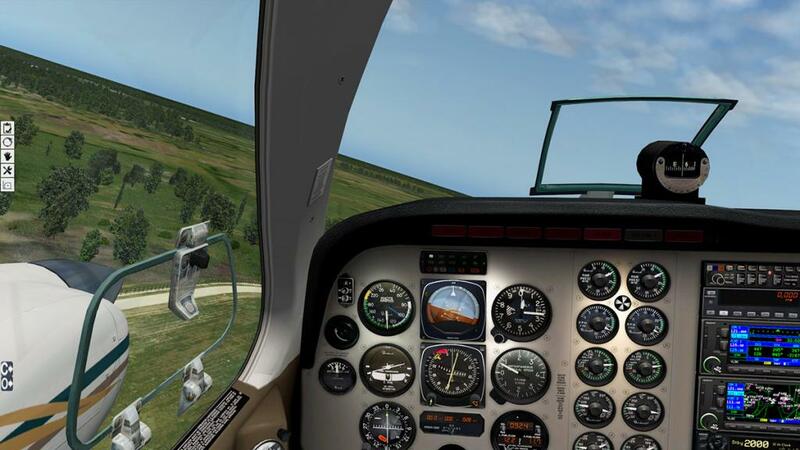 The constantly popping-up kneeboard is seriously annoying, as it come on the screen at important points in your flying, like taking off or landing, and yes it is a distraction you don't need unless called for, and the drone sounds are for a particular ear. 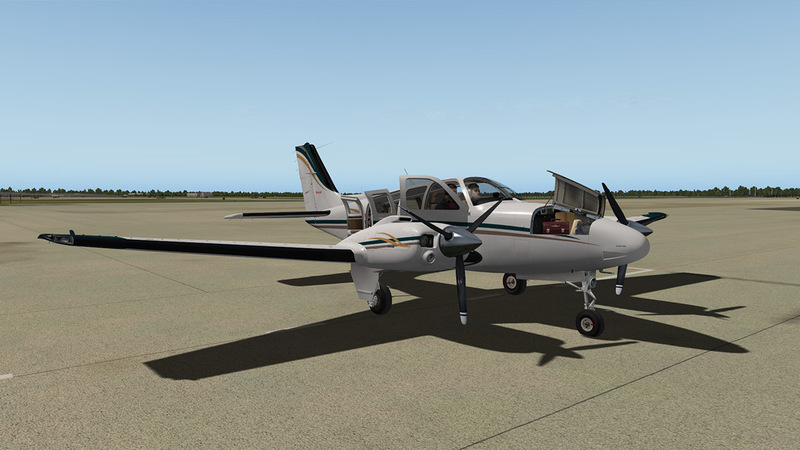 But I did really like the ultimate realism of running the aircraft and maintaining those engines, this is of course no load in X-Plane and fly aircraft, as the walkaround has to be completed and the engines when started need time to warm up and settle down (just like the real thing). 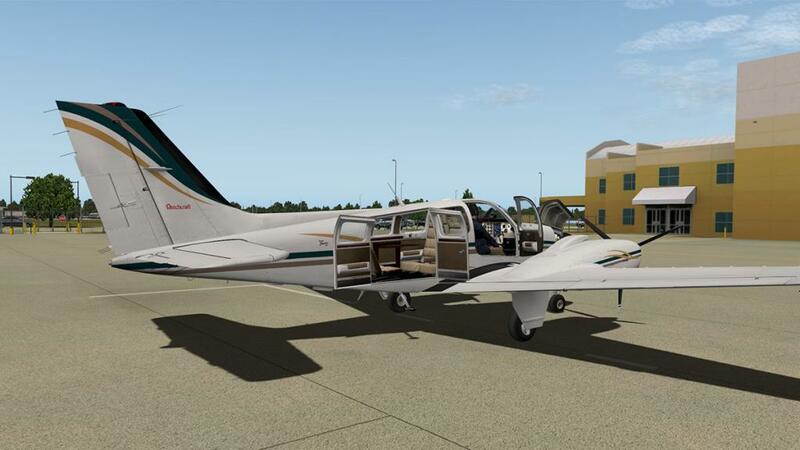 Maintenance needs to be completed and this is an aircraft that would require a log book and running details noted down, but then that is what the REP is all about, ultimate realism of running your own General Aviation aircraft... and in that scenario you get the full works here. Required for the use of this plugin! Installation : Download is 5.80 mb which is unzipped and inserted to the Carenado B58 Baron "Plugins" folder. Key authorisation is required. Do you talk about Carenado or SimCoders ? 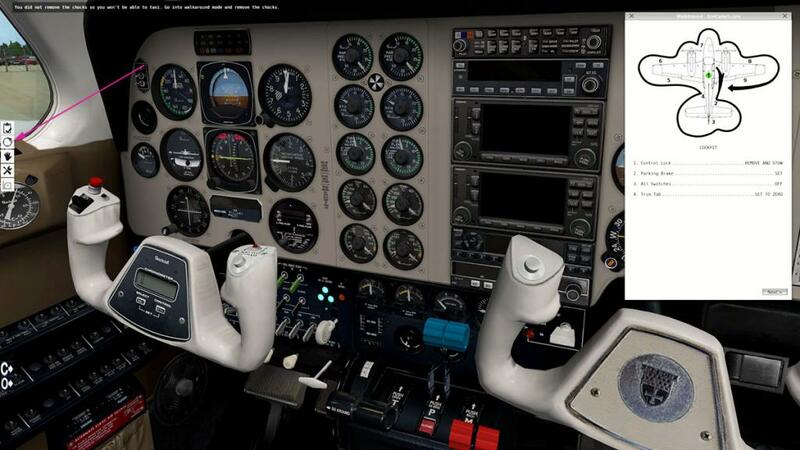 I guess SimCoders will not integrate the GNS530 since it requires to work on the 3D cockpit for the least, it's a job for the original author: Carenado.